There are other options, however. One of these is for Israel to simply attack Iran ‘unilaterally’. Of course, such a strike would be anything but ‘unilateral’ since Israel could not possibly strike Iran without the US being complicit in such a strike. The ordnance and fuel for such a strike would have to come from the US and the ordnance and fuel required to fight the resulting war with Hezbollah and Hamas would also need to come from the US. Once Israel has made the first strike against Iran, the US would then be compelled, albeit with a massive show of faux reluctance, to support Israel by launching attacks against Iran designed to prevent Iran launching any retaliatory strike against Israel. While the US is then dealing with finishing off Iran, the Israelis would then be free to massively attack both Hezbollah in Lebanon and Hamas in the Gaza Strip followed up by invasion and occupation, all while the worlds eyes are on the ‘main event’ which is the US bringing Iran to its knees. Another option would be for the Israelis to somehow provoke, possibly by some false flag event, war with Hezbollah and/or Hamas which they would then quickly escalate. Then, the moment either Hezbollah or Hamas fire any rocket at Israel that was not previously in their arsenal, Israel and the US would have casus belli to attack Iran. 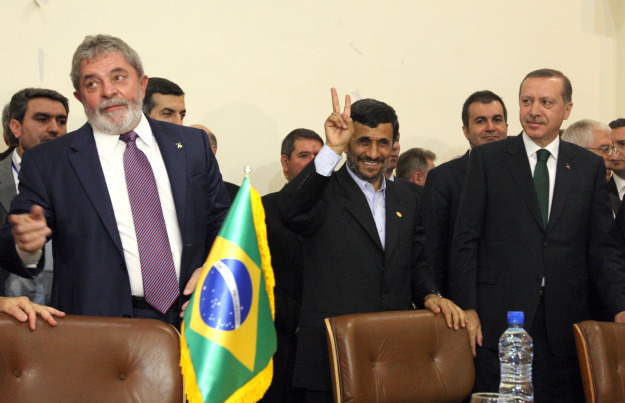 You must click that pic to enlarge and see the look that Erdogan is giving Lula. Trust? I don't think so. And Erdogan would be exactly correct in my opinion. Remember the Tri-Border Area, where Brazil, Paraguay and Argentina meet. Organized crime paradise. Keep in mind who runs organized crime. Back in 2002, CNN reported, from various unspecified "intelligence sources," that al Qaeda terrorists were meeting in this area and plotting to attack US and Israeli interests, in conjunction with Hezbollah. 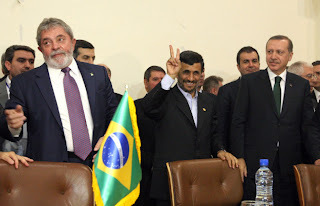 Lula has kissed the ring or whatever one has to do to be considered a rising star by the international cabal. The 2016 Olympics will be in Rio de Janeiro. Meanwhile, we have Paraguay and Lugo over here on the left. To refresh our memories on Paraguay: the Bangkok of Latin America, and not for nothing, in which we learn about the Tri-Border Area, the Jesuits, Chabad, organized crime, government corruption, and human trafficking, not necessarily in that order. The average American doesn't hear about Paraguay, though it's an organized crime paradise. Why is that? Paraguay not ready to come out of the crock pot yet? Maybe soon. Lugo has ties to the CIA. Put those two clowns together. The explosive cocktail of insecurity, drug traffickers and guerillas has kept Paraguay on edge as of 2008 ever since the high-profile kidnapping of cattlemen Luis Lindstrom first and Fidel Zavala afterwards. Both were released after paying a ransom (over US$1 million) to the Paraguay People’s Army (EPP), a leftwing guerilla organization. Although some link the EPP to Lugo himself (it reportedly has members that were seminarists when he was the Bishop in the San Pedro district), its real connection is to Colombia’s FARC from whom they may have acquired military training. In order to counteract such FARC-EPP relationship, Lugo’s government has asked for the help of Colombia’s armed forces and police to train Paraguay’s security forces to fight both the narco-guerilla forces as well as to increase the participation of Paraguayan society. ...“The largest criminal factions in Sao Paulo have set up in Paraguay and have imported practices not carried out by Paraguayans such as the summary execution of enemies,” Folha de Sao Paulo reported over the weekend. According to Nelson López, the head of Paraguay’s SENAD narcotics bureau, “that Brazilian faction is acting to control all the drug trafficking activities along the border and if we allow it this could become a Mexico or new Colombia,” he warns. Things must be ready to escalate. So Lugo wants help from the Colombian military. Israel and Colombia? Very tight. Now Lugo will also get help from Lula. Brazil and Israel? Also very tight. A 2009 RAND study examines how Hezbollah has benefitted from film piracy proceeds in the tri-border. The State Department terrorism report maintains that the United States remains concerned that Hezbollah and Hamas sympathizers are raising funds among the sizable Middle Eastern communities in the region, but stated that there was no corroborated information that these or other Islamic extremist groups had an operational presence in the area. According to Argentina’s Special Prosecutor Alberto Nisman, appointed to lead the AMIA investigation in 2004, the AMIA case is still alive and progressing. To date, $1.5 million in Iranian assets have been seized and the seizure of more than $600 million in assets is pending; such funds would help cover restitution to the families of the victims and material damage from the bombing. The usual suspects, and I'm not talking about Hezbollah and Iran. But you know how you really know that the Tri-Border Area is ready to come out of the crock-pot? Because Hollywood discovered it, and they're going to THROW THE SPOTLIGHT ON IT NOW. The Oscar-winning director Kathryn Bigelow has angered the Argentine and Paraguayan governments who claim her next film Triple Frontier could destroy their tourism industries. Bigelow hopes to make her film in the border region between Argentina, Brazil and Paraguay - one of South America's most visited tourist destinations thanks to attractions such as the Iguacu Falls (above). However the area is also notorious for activities such as smuggling, arms dealing and drug trafficking and it is these aspects which Bigelow wants to throw a spotlight on. Erdogan better double his security detail, since he's already pissed of that SLC several times in the past and that's one way to a shortened life span. dubs, i hope he can get through the media gauntlet. greg, no doubt. he's got to have nerves of steel. i like the guy.